I met artist Fiorenza Menini during late summer 2014. After visiting Toulouse, I took the train through the Côte d’Azur over to Rome to stay with a longtime friend from grad school. I was in no rush, so I stopped for three days in Nice. Menini and I share a common affection for the people and streets of her fair town, and she graciously showed me the Cours Saleya market, the quintessential socca crepes, and her own artwork, which struck me as compelling and vivid in surprising ways. Her photos capture the vulnerable, delicate complexities of the subjects she meets, while being distinctly present-tense; never idealized or derivative. She shared with me some of her motivations and techniques. Buddhistdoor Global: How do you view some of the deep underlying aspects of our humanity, the ways we connect with other human beings? How do you capture these in your work? Fiorenza Menini: I could simply photograph from the outside, as many do, yet my mindset is to draw out the interior mood or more guarded personality of a subject. Developing a closeness with someone I have just met allows them to feel at home with me. This creates an inner sense of peace and acceptance. They will then allow themselves to be seen because they feel safe and inspired. The only way to accomplish this is to genuinely love humankind. For me it’s a meditation, a daily reset to an authentic way of seeing and understanding. One can use the photographic relationship to objectify, but I prefer to use it as a quest or a practice to see past ordinary perceptions. This kind of instant intimacy is going out on a limb, especially in our modern world full of anonymity, uncertainty, and aggression. BDG: How is your process unique from that of other photographers? How do you gain trust and relate to your subjects? FM: The photographic process is not only to observe from far away, though photojournalists often say do not intervene in what you see, just be an observer. Photography can be a tool to develop intimacy as well, for two-way communication. I develop this rapport with strangers, whether posing them for portraits or in small groups or pairs for my still or videographic works. The photographic camera, and the proposal to capture a scene or portrait can also be a moment of exchange, reflecting on who we are, here and now. It can even become a little workshop for tempering the false idea someone has of his or her own self-image! BDG: How does your process encourage subjects to see themselves more clearly? FM: Even alone a person can feel “out of sync” with themselves, and further alienated when in front of a camera. Taking a portrait can bring out someone’s social masks, which I seek to soften in order to reveal the layers of human intricacies at play. But what if a sudden transformation leads a person to feel even further from themselves than they had imagined? After all, a photo is never someone’s reality, but only an illusory surface; they suddenly see their inner beauty, opening as a presence. For the series Les Passagers de Nice, I asked each individual to write down a new spiritual transformation they experienced from the process; a challenge they faced or a true change, however small it may have seemed to them. Because Menini doesn’t work with models but with people she meets in the street, or with friends, none of them have been professionally photographed before. She also works with groups of people who, though they regularly interact, may avoid physical contact between each other. Some examples are sports teams, groups of students, dancers and performers, even couples. Built jointly by Menini and her subjects, the images are born with the camera as midwife, creating the emergence of an instant, captured timelessly on film and paper. What exactly is apprehended? The momentary interplaying rapport between the subject and his/her own experience, or the individuals relating, together with the photographer herself. In other words, there is more to it than immediately meets the eye of the viewer. BDG: Tell me about your series Links, of the London Women’s Volleyball Team. FM: These very tall young women came from tough districts of London. Most of them were ostracized as youths from other kids (and most men) for not looking very feminine and appearing homosexual! So, I realized that even if they worked together, traveled together, had technical contact with each other during their games, they never had a tender, friendly touch as it was too scary to encounter homophobia, however misplaced. I proposed that they take some inner time to reflect and pose silently in deep acceptance of whatever physical contact they decided upon. And strangely, they appeared as a Madonna, immersed in spiritual energies for just a moment, that I could capture if it felt right. Menini was deeply affected by the brutal truck massacre in Nice on the Promenade des Anglais, Bastille Day 2016, for which she was present. Witnessing the attack, indeed having to leap a barrier to avoid being struck, she suffered PTSD for some time afterward, staying in seclusion. 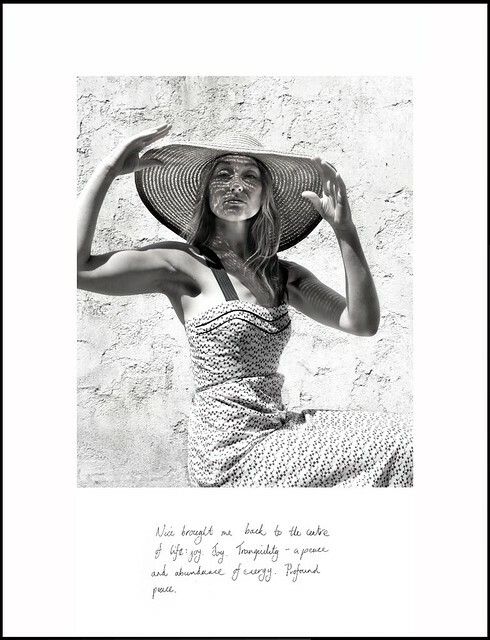 But her resilience as an artist, a Niçoise, and as a human being brought her out of the shell again, and into relating with friends, neighbors, colleagues, and back to the creative process which reconnected her to the community. BDG: How was it to regain equilibrium and begin working again after this trauma? FM: On my first outing after the Nice attack, I was able to catch this loving kiss on the fly! A photo that brought me from the shadows, a heart rescue. Have you ever spent a day with a couple you really didn’t know? I did. It’s quite strange to be privy to an intimate relationship, and to see how two individuals move close and far apart again and again all in a day! And what a gift when the harmony and trust are just there with the photographer? True love is rare, and genuine physically tender contact is quite rare to capture in a photo. 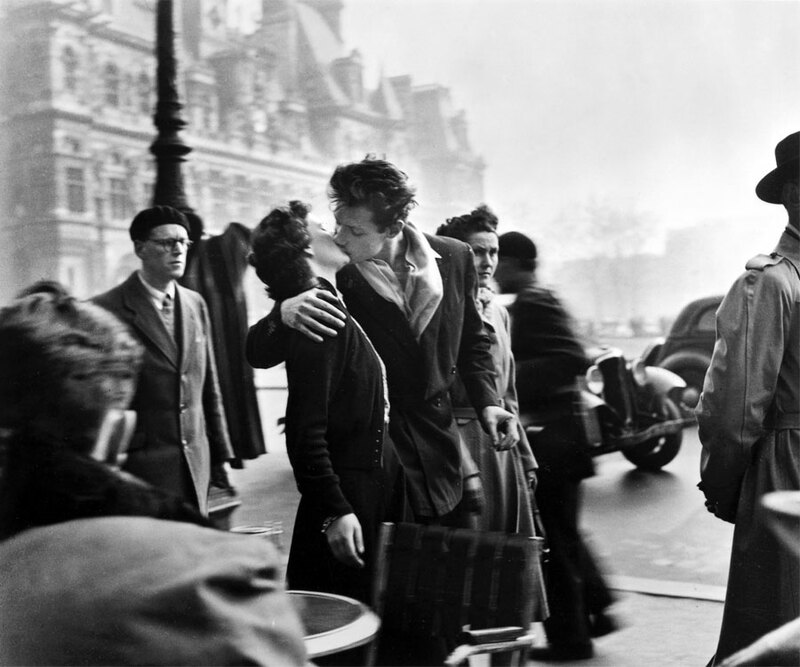 Even Robert Doisneau’s famous photo The Kiss (Il Bacio dell' Hotel de Ville, 1950) was staged with actors. I feel so blessed to be the keeper of these genuine lovers’ intimate moments. Menini’s work accomplishes just this, a rare confluence of inner subtly and coherence, radiating a sense of compassion and connection, which lead us to perceive and relate in new ways. The spaces within and between us are sacred spaces and the endeavor to explore them is a form of practice, whether through conversation, meditation, or creative expression. * “Nice brought me back to the centre of life: Joy. Tranquility—a peace and abundance of energy. Profound peace.” ~Quote by Ruth, portrait subject. ** Thinley Norbu Rinpoche. 1992. White Sail, Boston: Shambhala Publishing. p. 66. *** Thinley Norbu Rinpoche. 1995. Magic Dance. New York: Jewel Publishing House. p 129.